Aside from being bombarded with every single minute detail of the American presidential election until November, 2008 already looks to be throwing some fine shapes: next month alone I'll be eating my way through Fes and Italy. I happily saw out 07 in London (the capital is quite endearing when there's no one in it) and, unlike Chew, with no Christmas dinner duties I had time to venture to markets out of my hood and indulge in some lingering home cooking. The Slow Food Market on the South Bank on December 23rd was light on for action (perhaps unsurprisingly). 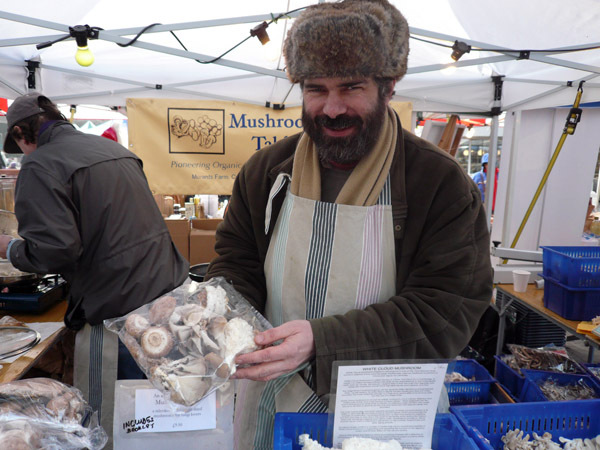 But the mushroom man from Stoke Newington's Farmers' Market was there and I picked up a huge bag of mixed wild mushies to accompany a gnocchi recipe from Chew's fab birthday pressie last year, Antonio Carluccio's Complete Mushroom Book. 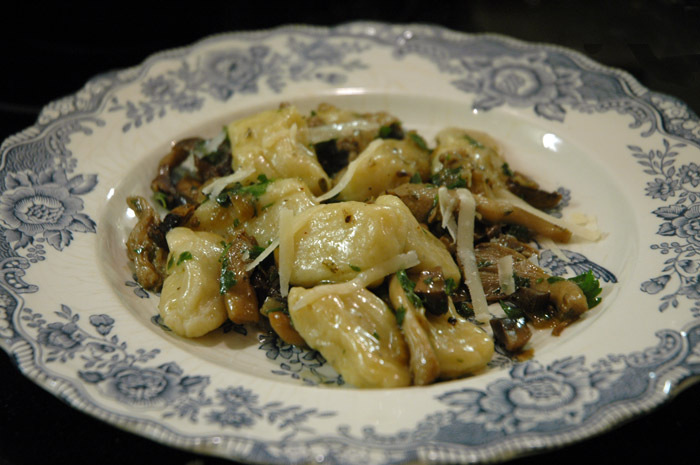 I'm not kidding, that's what Carluccio calls this recipe. He is referring to the type of mushroom - Horn of Plenty - but any wild ones will taste so delicious that eating it may very well give you the horn. Boil and drain the potatoes, making sure all water is steamed off (let them dry out a bit over the heat if you want). 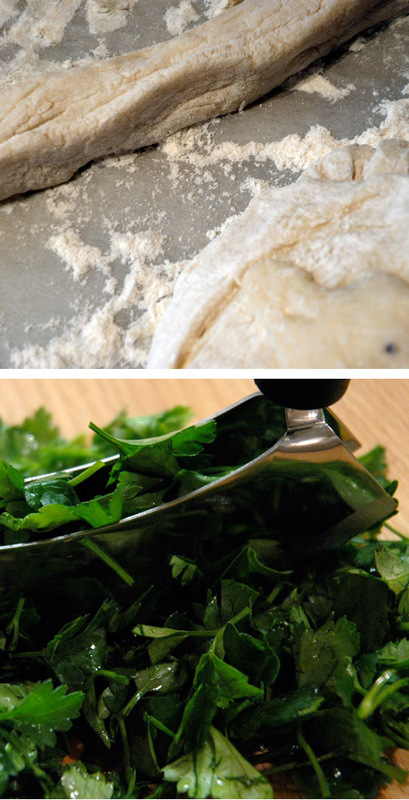 Mash them finely - roughly by hand and then in a food processor if necessary. 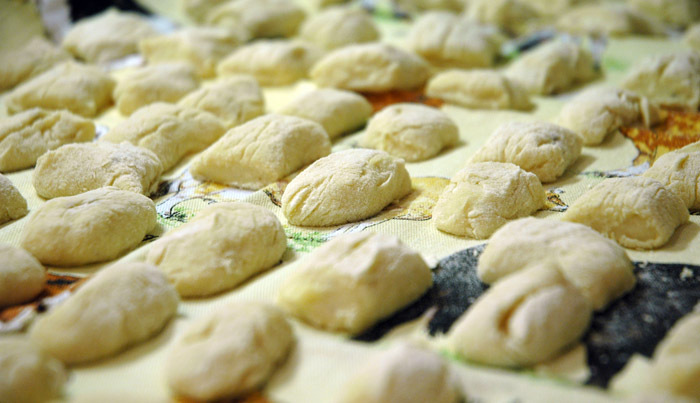 Mix with the flour and beaten egg on your bench and roll into a dough. 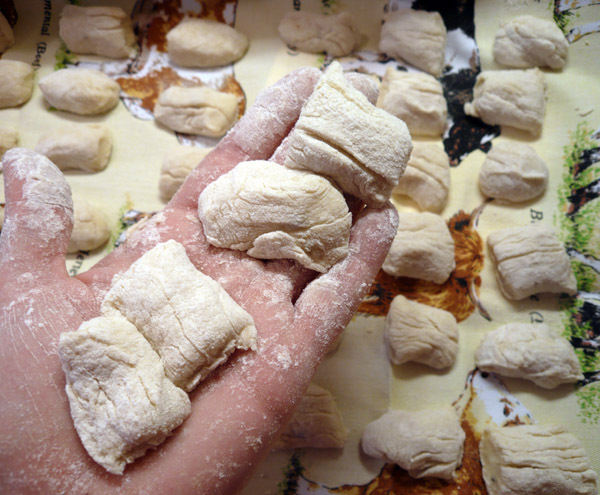 Keep loads of flour on hand because the dough is quite sticky. Roll out into sausages and cut into desired chunks (about 2 x 2.5 cm). Leave to rest on a clean, floured cloth. For the sauce, chop all the mushrooms into strips. Soak the dried ones for 20 minutes then chop them finely, reserving the water. Melt the butter in olive oil then fry the chopped onion on a low heat to soften. Add the mushrooms and cook slowly for about 15 minutes. Add some of the dried mushroom water and the wine and reduce for another ten minutes. Just before serving, mix in the parsley, some salt and lots of cracked pepper. 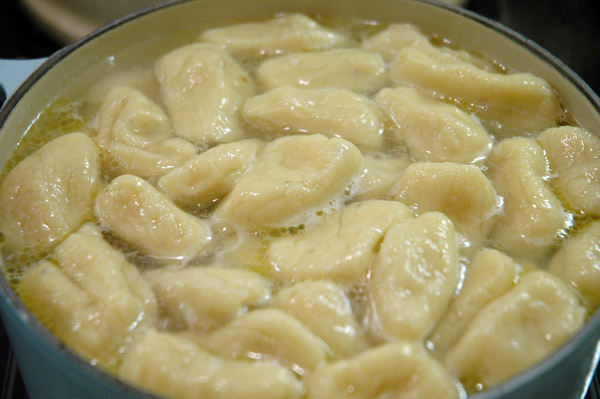 Cook the gnocchi dumplings in salted boiling water until they float to the surface then chuck them in the sauce. Shake it all about, add some parmesan and dig in.